I performed side-by-side testing to find the best baking pans! Including nonstick vs. aluminum, and which pans specifically you should NEVER use! Keep reading to find out my all-time favorite pan. 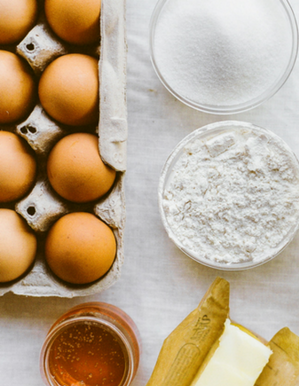 Baking equipment is just as important as the the ingredients you use. But since most of us stocked our kitchens ages ago, we might not realize just how big of an impact our pans have on our baking! That’s why I decided to put a bunch of baking pans to the test. For this post, I focused on sheet pans and cookie sheets to keep things simple. There are SO many types of baking pans but I figured your standard sheet pan/cookie sheet is the most used in the kitchen. 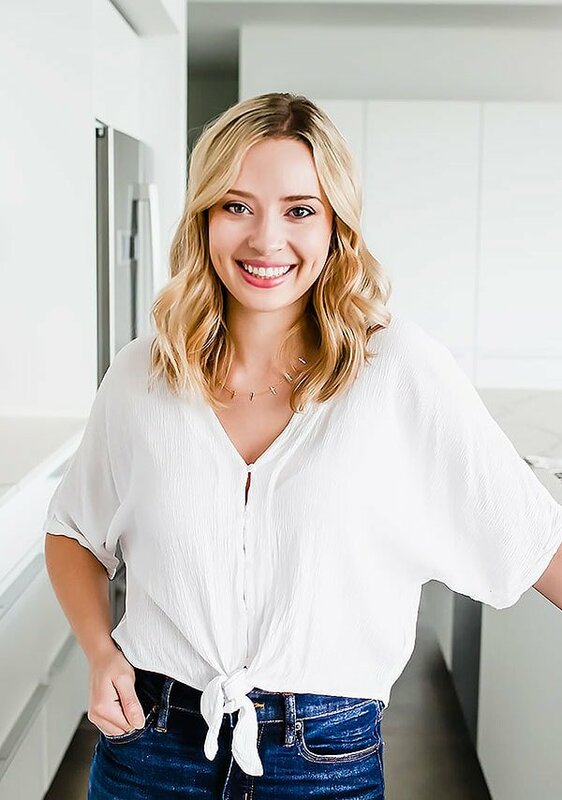 Note: if you’re curious about my FULL list of recommendations for my favorite baking equipment, or are interested in baking science, then you’ll probably LOVE The Magic of Baking online course + community I recently created. I hope you’ll check it out! But for now, let’s focus on the best baking pans (and the worst) that I’ve meticulously tested. Which baking pan is the best? I love my go-to unlined aluminum sheet pans. In this series of testing I used the Nordicware brand. To me, it yielded the perfect Goldilocks batch of cookies which were wonderfully golden brown. This is the basic type of pan we used in culinary school, just the full sized versions. This is what you’ll find in most professional kitchens. I use these pans every single week, sometimes daily, for both sweet and savory preparations. In this case, the simplest most basic option is the best and most versatile. I have five of these pans in my kitchen! I also use this pan so much because when I’m testing new recipes to share with you I take a few precautions. I always use the most straight forward and basic equipment possible, like these unlined sheet pans. I don’t want to skew or warp my baking results because I’m using different or high end equipment that most of you won’t have. However, I also have two more recommendations depending on your preferences. Then you may want to chose a nonstick option. I’d recommend the OXO Good Grips Pro Half Sheet Pan. It’s ceramic-reinforced with a two-layer coating for easy food release while protecting against scratching, staining and corrosion. You can see from the back of the cookie on the right that it’s also micro-textured with a non-stick pattern to minimize surface contact and increases airflow for an even baking. I’m thinking this makes the pan bake more quickly, so that’s another reason why these cookies browned more than the unlined aluminum. The next time I bake with this pan, I’ll probably shave a few minutes off the baking time. I really like this one! Then you may want to choose the T-Fal Air Pan option. The layer of air in the center of this pan reduces the heat of the pan, reducing browning and burning. I personally don’t like this result, but I know many of you do so I wanted to mention it. I would definitely NOT recommend the Walmart Mainstays pan, it was super flimsy. It warped AND rusted after first use and cleaning. 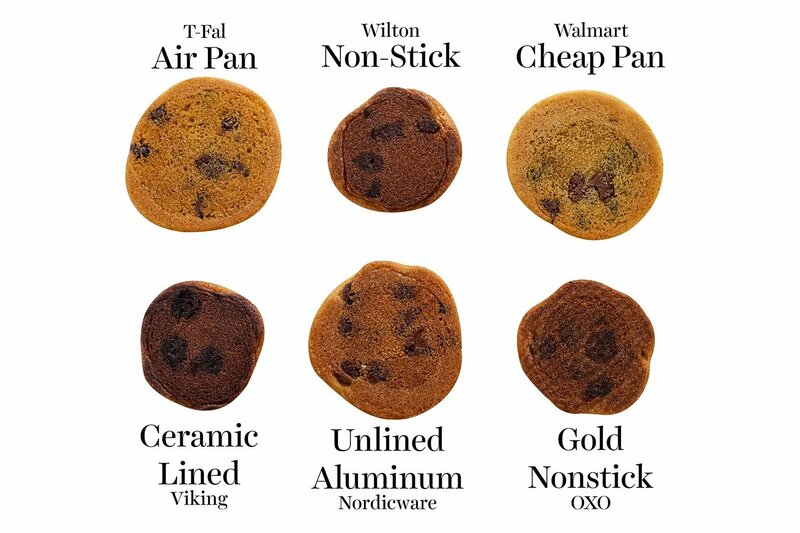 I also wasn’t a big fan of the Viking pan either, which basically burnt my cookies. Let me know in the comments below which baking pan is YOUR favorite, and if you learned anything through my experimenting! I hope you found this helpful. 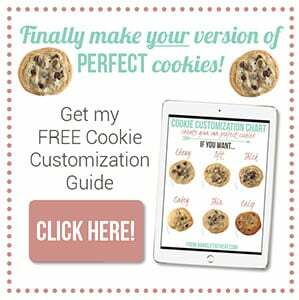 I love to bake cookies and I use Pampered Chef baking stones. They work well for me. Have you used them? Any thoughts? My mom had a pampered chef baking stone when I was growing up and I just found that option to be too much of a burden to wield (heavy!) and clean, especially when I want to bake multiple batches in a short period. I only use a baking stone for artisan bread and pizza now. 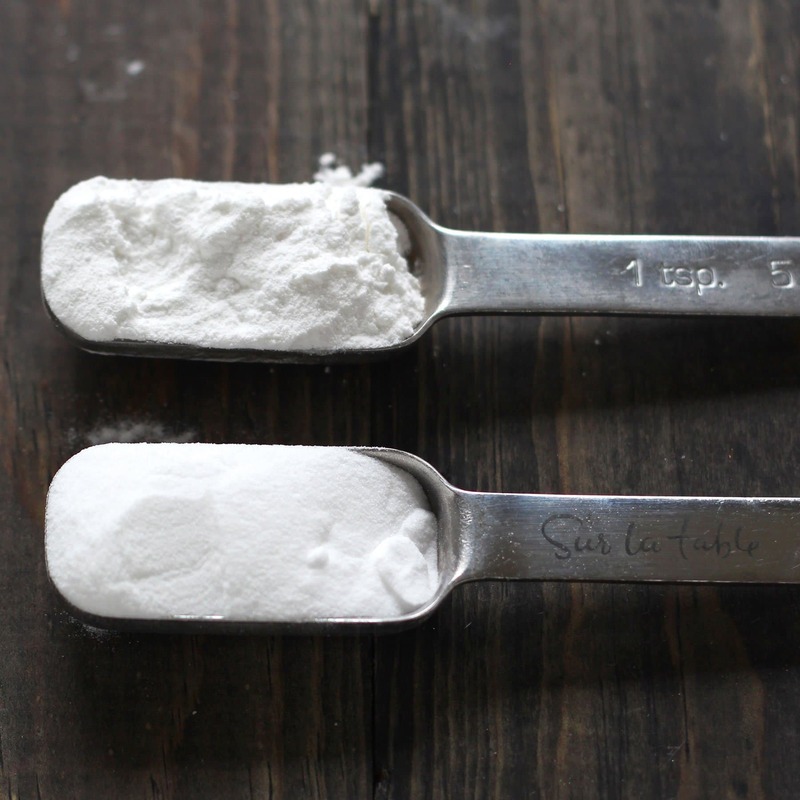 Do you ever use a silpat liner on your cookie sheets? I generally prefer to use parchment paper, even less clean up! For this test I baked the cookies directly on the pans. This is a great post! I have three Vollrath Cookies Sheets that I’ve used for the last several years. I’ve found they work best for me. You should see my collection of baking pans before I found these! You should do a post on any differences with pan liners, like silpat versus parchment. I would like to see your results, if any. Thanks! I use the standard food service half sheet pan lined with parchment paper and have had no issues baking on it, sweet or savory. I have 5 of these. Having spent a lifetime in the restaurant business, I go with Vollrath & parchment paper. Before I try this recipe I’m curious as to why you didn’t use espresso powder. Also, I’d like your take on the Epicurious article last spring, “Is Real Vanilla Always Better Than Imitation Vanilla.” I found it very interesting! I purchased a set of air pans a while back. More expensive than I would normally spend but I anticipated great results. Unfortunately every cookie I baked was hard and dried out – almost like it was dehydrated. I baked until the top had a touch of brown so I tried again at a lesser bake time. Cookies were pale but still dried out. What gives? Oh that’s interesting, and why I typically prefer to bake on the most standard pans I can find. Sometime’s it’s not worth having to experiment so much to get it right! I’ve bee using the insulated air sheets for 25 years. I got them as a wedding gift and they are the best thing ever. As you said the chewy texture is something that my family LOVES so these work best for us. The problem is that I don’t know can figure out what brand they are and I’ve tried others and they don’t stack up. If anyone know a trick to figure out what the brand is since I can’t seem to find it… I’m all ears! Hi Tessa. I used to use nonstick baking sheets but then realized the cook all food very differently then aluminum. The bottoms of scones and cookies were darker even though I stayed within the suggested baking times. After switching to aluminum, I noticed a big difference. The bottoms of the scones and the cookies were more to my liking. I do not even like non stick dark muffin pans as well. Thanks for sharing that, Ann! I love my Nordicware baking sheets. Sometimes Costco has them in the fall very reasonably priced. When I was in high school, we made corrugated aluminum pizza pans, and I have been using them for cookies for years.. never had a problem. Since they are corrugated, the surface isn’t completely flat and the bottom cooks better. Wow, I would have no idea how to make something like that! What a cool project. When we were young and broke we used Walmart aluminum pans. Then I found some Wilton pans on sale AND I had a coupon. I was pumped! I bought four. Wilton was the go to brand for baking, right? Wasn’t that impressed. A friend had the air-bake type sheets…. wasn’t all that impressed with hers. Sister-in-law got a Pampered Chef baking stone. Liked it for pizza or bread. Cookies? Not so much. Then I tried a Nordicware. (Cue heavenly choirs….) Plain aluminum Nordicware. Love them! Best cookie sheets ever in my opinion. I have four which is just right for batch baking in my kitchen. I gave the hubs the Wilton pans to use when he’s grilling but threatened mayhem and murder if he so much as looked like he was even thinking about touching my Nordicware, lol! I have the full sheet aluminum pans with a lip that I buy at Sam’s Club. They are two pans for under $10. I’ve used them for years for all my cookies and I love them. I always line them with parchment paper too. I like my Doughmaker cookie sheets. I also have All-Clad cookie sheets but prefer the Doughmaker. The All-Clad cookie sheets are very heavy but they do give an even baking to the cookies. I use plain old aluminum pans that I purchased from Sysco, one from target that’s almost the same. I love them, use them for everything! so very happy I found you!! What type of sheets would these cookies yield? I like the “Goldilocks” version that you prefer as well. I have these but am almost tempted to buy the ones you use if they’re more likely to turn out that way. I have had pretty good luck with these though. I also use parchment paper. I’m not sure, Jessica. I’ve never used those. Cool test, but I would be interested in seeing the exact same baking test with all pans again, but this time using parchment paper on each pan. 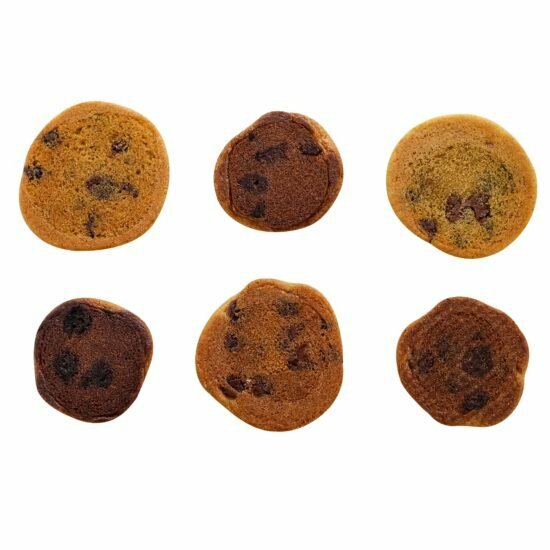 Would the bottoms of cookies from each pan brown similarly to the no-parchment outcomes? I, as most, unless stated, are normal ppl. and appreciate that you were thoughful enough to think of me (as most)! And am looking forward to more related, updated, etc. informative articles from you and your “Down to Earth” personality. Take care and God Bless! I never use anything anymore except my Airbake cookie sheets. I’ve never had burned cookies and my family and friends love the crisp edges and soft middles easily achieved with these pans. I’ve given many as gifts and have heard nothing but praise for them. Probably the one caution is to take care of them. Hand wash and don’t submerge, but they are easy to clean. Did you try the USA BAKEWARE? I have not tried the Nordicware cookie sheets, but have several cake pans. I really do like the USA cookie sheets. Is Nordicware better? I love my Pampered Chef stones. I bake all my cookies on them. I have never had a problem. The only thing I need to use parchment paper with is press cookies. I use the parchment paper to get ahead of the pans and just slide it on. If parchment paper or a silpat mat is used, how much does the actual pan matter since the dough is not directly on its surface? I use .. I think they’re air pans .. many years old with only the one up edge. I use parchment on them cuz I enjoy the ease of removal. Hi Renee, To answer your question about insulated air sheets. I have had mine for 25 years also. I love them. they are by Rema Bakeware. I found the name on the back under the little lip.. Hope you can find them.. Loved this information. Will definitely look for your website in the future. I love baking with my USA pans. Have you ever used those? However, I have a gas range with the double stove and I noticed that my cookies bake differently in the top oven than they do in the bottom oven. I like the way they bake in the bottom oven better. It’s a convection on bottom but I don’t use the convection setting. Any thoughts as to why? Such a great informative post, thanks Tessa! I am loving the nordicware pan result too! I can’t wait for to get one for myself! Really love baking with the Williams Sonoma Gold Touch non-stick baking sheets. Have you tried the “food network” pans? Ceramic or nonstick? I am in the middle of remodeling my 1906 house. So I am living in a tiny travel trailer in the back yard. The oven is tiny so regular cookware doesn’t fit. I went to the Dollar Tree and bought a sampling of their tiny baking things. Those pans cook beautiful. I was shocked. Perfectly browned bottoms, no warping. Probably die from whatever metal they are made from but I’m willing to risk it for cinnamon rolls, cookies warm from the oven and lets not forget corn . I luv your newsletter! Over heated Teflon coating emits vapors that kills birds. For the safety of my little parrots, I gave my non stick coated pans away and bought a couple of pizza stone. I use parchment paper to line the surface, and the cookies turn out beautifully. I just wish the pizza stones were not so darn heavy! Hi- can you provide a link to the parchment paper that fits your nordicware cookie sheets? I like pale and soft the best. My cookies improved so much using half sheet pans lined with parchment paper. 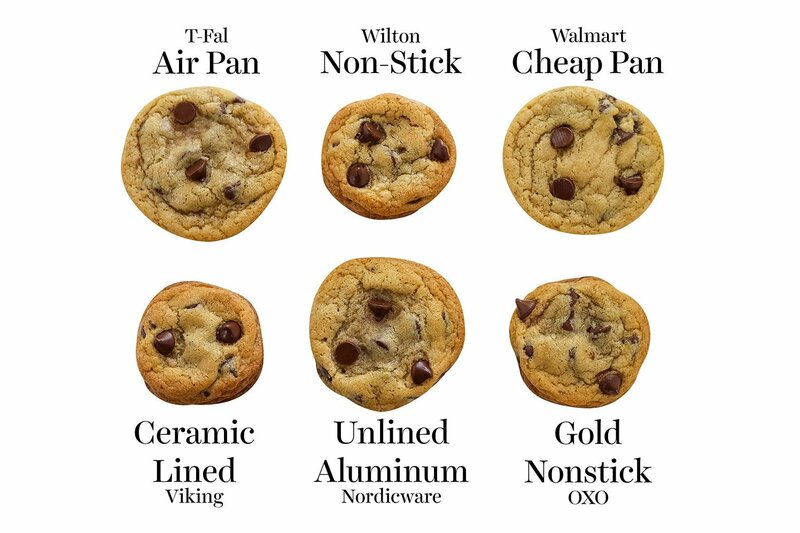 Hi, after using this for a science project I realized that it all depends mainly on how you like your cookies. This was a great resource. Found this page while researching a question that has nothing to do with baking cookies! After reading a lot of replies, the answer seems to be — if it’s been working for you for a number of years, great! ; if you’re new to baking, try the Nordicware. BTW, you might be interested to know that Cook’s Illustrated did a study similar to yours a while back and also chose Nordicware!